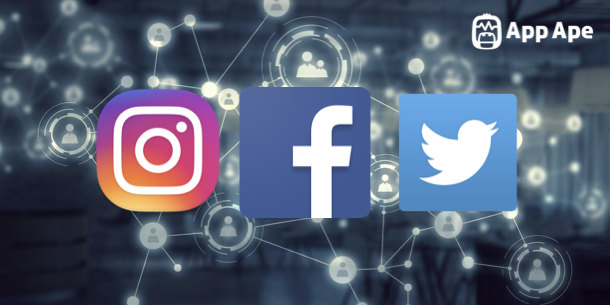 Social Networking Services or SNS is an online platform to build relationships and connect with people who have the same interest. But what comes to mind when we say Social Networking Services (SNS)? Facebook?Instagram? Yes and No for iOS users of Japan and South Korea. 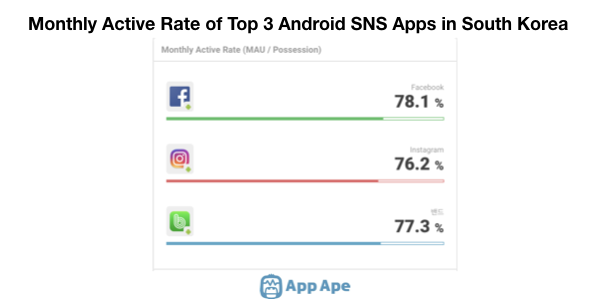 This article compares the top 3 iOS and Android social networking applications using the data gathered by App Ape’s analytics tool in terms of Monthly Active Users (MAU) in September 2018 for 7 countries namely as Japan, South Korea, USA, Indonesia, Germany, India, and Brazil. We are going to start with the iOS apps analysis, you’ll find our Android analysis after this one. Could Facebook lose its charm? Twitter has been gaining exceptional popularity in Japan. Once behind Facebook, it has now secured a position in the top 3 ranking of social networking chart and has 30% higher monthly active users. The drop in Facebook MAUs is believed to have helped Twitter boost its favorability. In addition, Twitter allows for a fair degree of anonymity which some users find attracting as they do not need to reveal who they really are. As shown in the graph below, Twitter also beats Instagram in number of MAUs by a considerable percentage. 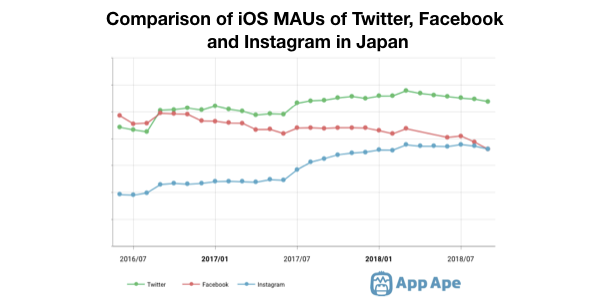 Nonetheless, Instagram, already in 2nd position of Android MAUs chart and very well-received in Japan, could some day take over Twitter amongst iOS charts. Korean iOS users, same a their Android counterparts, used BAND as their primary social networking applications in September 2018. BAND, a Korean-born social app, is designed specifically for group communications has beaten Facebook and Instagram in MAU rankings. As opposed to Android where the 40 plus year-olds make up majority of the users in September, iOS dominant users in the same month are in 20s to 30s with a remarkable 68.1% out of which 19.9% are males aged between 30 to 40. What the above formula tells us is basically how many users who own and have a certain app installed on their phone actually use it per month. 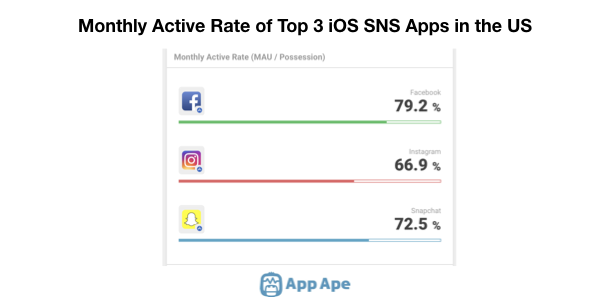 Facebook being the top app in the rankings has a higher MAU rate than the other two. Having said that, as seen above, Snapchat (ranked 3rd) has a 72.5% MAU rate compared to that of Instagram (66.9%). In other words, 72.5% of those who have SnapChat installed on their phone actually used the app in September 2018. Snapchat seems to be not as popular in Japan and S.Korea as it is in Germany and the US. This social communication tool allows users to send messages using pictures and snaps that automatically delete after a certain amount of time. This is one of the main features of Snapchat that has attracted many who are concerned about their privacy. Popular amongst US celebrities, Snapchat has a long way to establish a presence in far-east Asian market. 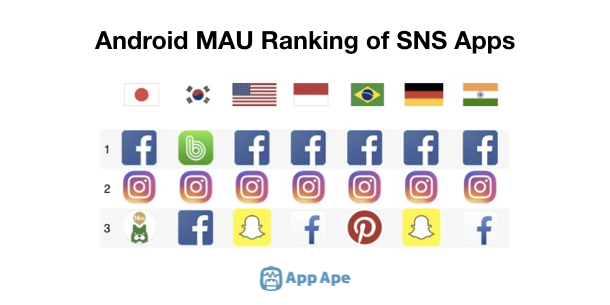 App Ape indicators tell us that Snapchat has to make a lot of efforts to enter the top 20 charts in countries like Japan and S. Korea where it was ranked 77th and 98th respectively in terms of September MAUs. Ameba, a Japanese social networking application enabling users to post blogs, has been in the top 3 charts since June. Having said that, the number of Ameba’s monthly active users was less than a million in September. As seen in the image above, Facebook and Instagram lead the Android user ranking charts. 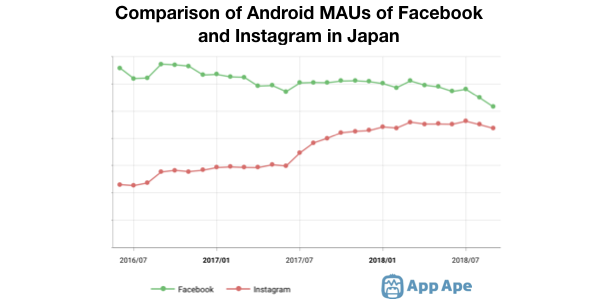 However, According to the data collected in Japan, MAU of Facebook have gradually been decreasing compared to that of Instagram where the numbers have almost doubled over the past 2 years. Could Instagram soon replace Facebook and top the ranking? We will have to wait and see! Korean Android users seem to show less interest in Facebook or even Instagram than any other country. As seen above, BAND, a Korean-born social app designed specifically for group communications, stands above all in September rankings. What the above formula tells us is basically how many users who own a certain app on their phone actually use it per month. In the above case, BAND, despite being on the top chart of user rankings, has a lower monthly active rate compared to that of Facebook. In other words, in S. Korea, 78.1% of those who own Facebook app use it on monthly basis whereas this number is only 77.3% for BAND. What is more interesting is that the dominant monthly users of BAND are over the age of 40 with a surprising ratio of 53.6% ! Snapchat has also a long way to establish a presence in far-east Asian market, but is doing a little bit better on Android. 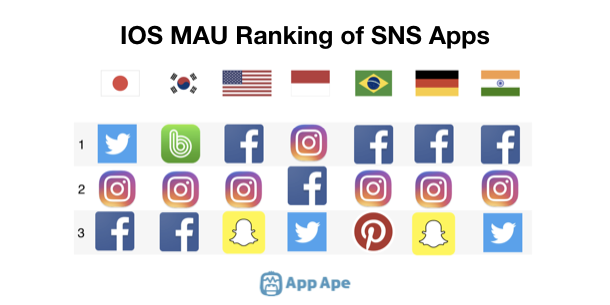 App Ape indicators tell us that Snapchat has to make a lot of efforts to enter the top 20 charts in countries like Japan and S. Korea where it is currently ranked 45th and 51st respectively in terms of MAUs. Facebook Lite, available on Android only, is an app that not many people may have heard of it. However it appears on top 3 charts in India and Indonesia. Its popularity may be due to the fact that Facebook Lite uses less data and has specifically been designed for 2G networks and areas where internet connection is slow or unstable. App Ape’s user-friendly Compare App tool allows for a thorough comparison of up to 3 apps simultaneously. The tool comes in handy when an individual wishes to gain a comparative understanding of own app and competitors’ Key Performance Indicator (KPI). Here, as an example of how the analyses work, we have demonstrated a comparison of gender ratio of active Facebook users in Brazil, Germany, and India. 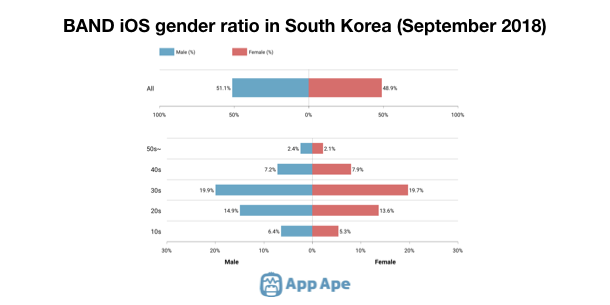 As seen above, the major Facebook users of Brazil and Germany in September 2018 are females with 51.6% and 50.3% user rate respectively. 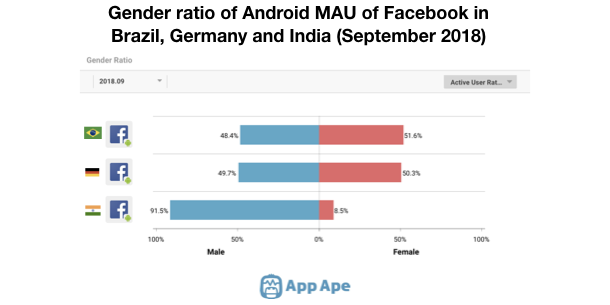 However, the dominant users of the app in India are males with a 91.5% to 8.5% ratio.